But if you want to learn more about the history of the more-than-century-old passenger-transporting company, you’ll likely need to do a lot of driving. Sure, you still can take a Greyhound bus to the company’s founding city of Hibbing, Minnesota, but you’ll be dropped off downtown at the Country Kitchen restaurant, several blocks from where you want to be — the Greyhound Bus Museum. The museum is located in an old bus station on the north side of town, up near the viewpoint to see the gigantic crater of the Hull-Rust Mahoning Mine. The museum’s location is fitting, since mining was why the bus company was founded in the first place. Andy Anderson and Charles Wenberg had a Hupmobile dealership in Hibbing and showcased one of their seven-seat motorcars by charging 15 cents a ride to shuttle miners back and forth from nearby communities to their work on the Mesabi Iron Range. But Wenberg wearied of the driving and sold his share of the fledgling Hibbing Transportation Company to Carl Eric Wickman, who soon enfolded a local taxi company, ordered a couple of truck chassis, had them equipped with bus bodies and, as they say, the rest is history. Well, except for the name, and Greyhound’s role in the civil-rights movement decades later. The company wasn’t called Greyhound until the late 1920s and you can pick your theory for why from among (a) all the buses were painted gray, (b) a gray bus reflecting in a cafe window reminded someone of a racing greyhound, or (c ) bus-producer Fageol presented the president of what then was known as the Safety Motor Coach Lines with an actual greyhound dog. By the early 1930s, Greyhound had become a nationwide carrier and the designated transportation provider for the massive and popular Chicago World’s Fair. In the spring of 1961, a mob, including members of the Ku Klux Klan, stopped and firebombed a Greyhound that was part of the Freedom Rides civil rights protest and beat the riders when they fled the fire. The Greyhound bus station in Montgomery, Alabama, later was included on the National Register of Historic Places. I learned much of what I know about Greyhound three years ago when the company’s centennial tour visited Phoenix. 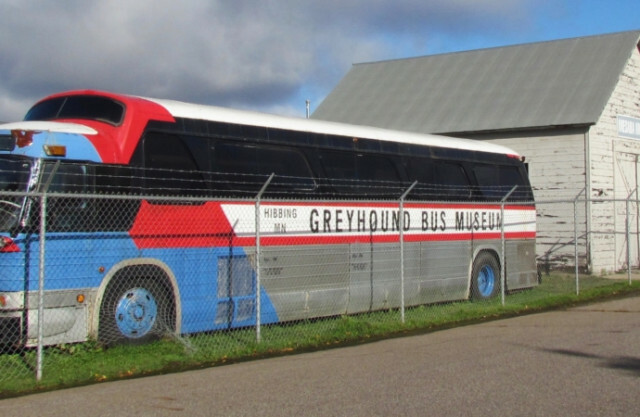 But late this summer, the Atlas Obscura website, which specializes in revealing fascinating geographic sites, did a report about the Greyhound Bus Museum in Hibbing. I was spending most of the summer in Michigan, planned to drive home to Phoenix by way of Spokane, Washington, to visit my son and a granddaughter, so why not visit Hibbing on my way? Sure, it would mean driving two-lane roads across Michigan’s Upper Peninsula, Wisconsin and Minnesota before joining the Interstate system at Fargo, North Dakota, but isn’t the best part of road tripping the serendipity of discovery along the blue highways? But while I do love serendipity, I also checked the museum’s website to make sure it would be open the day I’d be detouring through Hibbing. Sure enough, the museum is open from mid-May through September, and it can be opened during the winter months if you have a group of 10 or more and call in advance to schedule your visit.